When it comes time to upgrade your house, one of the most rewarding renovations that you can do is your kitchen. Not only will this enhance the aesthetic and value of your home, but it will make your living space even more inviting and functional. However, since there are so many different things that you can do in the kitchen, it can be difficult to prioritize them. Assuming that you’re on a budget (who isn’t? ), you have to decide which section is the most vital to the project. 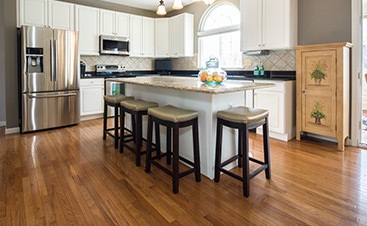 Although most people think of things like new appliances, backsplashes, and lighting, the fact is that your kitchen floor probably needs some work. As such, you have to make sure to budget and plan for it to be redone so that you can create a more practical and vibrant space. But when is the right time to do it? 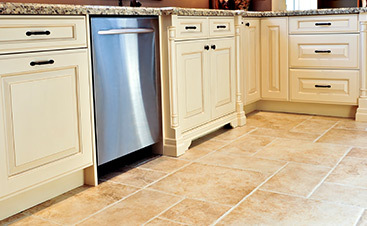 Let’s look at what it takes to redo your kitchen floor and see if we can’t come up with a smart strategy. What Other Remodels are You Doing? Since your renovation will vary much, you have to consider a few factors when trying to determine the order of operations. For example, if you want to install new cabinets along the bottom of your kitchen, is it better to do them first and place the floor afterward, or do you want to do the reverse? Similarly, are you adding other potential pieces, such an island or new appliances? Overall, anything that will be touching the floor or sitting on top of it should be considered before you start any work. Let’s look at three possible scenarios. This part of your home is split into two parts. First, you have the base floor or the underlayment. This is the section that will be covered by a finish material (i.e., tile, hardwood, etc.). If you’re not going to be adjusting the height of the subfloor, then you can probably wait until everything else is finished, including cabinets. 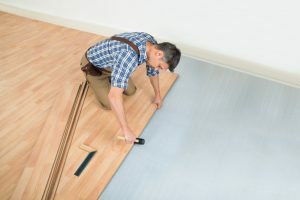 The reason that you want to do floors second is that you’ll be cutting it to size, so you want to wait until the cabinets, or other fixtures are in place so that you know what measurements you’ll need. Overall, it’s much easier to resize the top floor finish than it is to adjust your fixtures after the fact. If for whatever reason, you’re planning on raising the floor by at least a couple of inches or so, this will drastically change the dynamic of your kitchen. In this instance, since the surface will be much thicker than before, anything that touches the underlayment will be out of whack. For example, if you place cabinets first, the higher floor could render them useless. They may get sealed in place because the bottom won’t open once the surface is installed. Also, appliances like a fridge or stove can get boxed in, which will make it harder to remove them in the future. So, in this case, you want to put your floor in first. This way you can avoid these problems and ensure that everything works out. If you currently have cabinets that will sink into the new surface, you’ll have to remove those first so that it doesn’t become a problem later on. You don’t want cabinet-sized holes in your new flooring. Considering that this kind of renovation will require a lot of work, you may want to tear up your floor first because then it will make things much easier overall. By removing the surface, you can make sure that the island is sitting on the underlayment, which will make it much sturdier overall. Also, depending on the layout of your house and the complexity of the island, you may need to run pipes or cables underneath the floor. So, ripping it up first will make this whole situation much easier for both you and the contractor. Bonus: Should I Paint First? If you’re going to remove the floor, one question that you have to ask is whether or not it’s a good idea to paint before or after it gets replaced. For our money, we highly recommend that you either paint before the surface is removed, or when the underlayment is exposed. This will make your life so much easier because you don’t have to worry about things like drop cloths or stains on your brand-new flooring. In some cases, your old surface may get recycled, so that means that you should paint after it’s been taken out. This will ensure that it can get reused since there won’t be any paint stains on it. 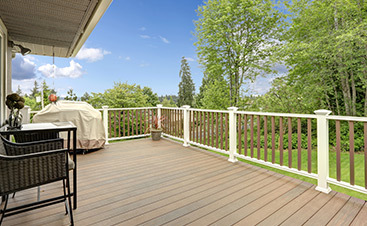 Hopefully, these scenarios have helped you determine the best time to replace your floor, but the fact is that you should also talk with your contractor. They will know more about what your requirements are based on your particular renovation, and they can give you prices and options based on your needs.